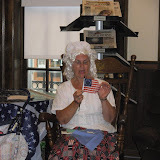 Boscobel Public Library: Walking Tour Guides! Your Boscobel Library has created a Historic Walking Tour of Boscobel. It includes a route map and key index to the many sights along the route. There are two guided walking tours (red arrow, one hour; red plus yellow arrows, two hours) of historic building and places in our community. Each site on the tour is numbered and corresponds to the information key which is shown below the map. Printed copies of these guides are currently available at the main Boscobel Library and in our Little Free Library kiosk at the front of the Boscobel Depot. We plan to create several other walking guides for sights and features in and around Boscobel so that both our visitors and residents alike can enjoy learning about all of the hidden treasures our community's rich history and natural resources have to offer. Other interactive, online features will be added as we develop the content of these community resources.